The film opens at a Thanksgiving dinner, where a Black family is gathered around the table at a brownstone in Harlem. The scene is reminiscent of many of my own family dinners, where we would share stories, tell secrets and bond over the things that connected us. From the jump The Wiz-which was released 40 years ago today-told a story of Black life that we all can relate to. I watched it for the first time when I was 12, and then countless times after that until present day. I remember how cool I felt when I would bond with other Black kids about a movie it seemed all of our parents made us watch. How enamored I was by the star-studded cast of Black entertainment greats like Michael Jackson, Diana Ross, Richard Pryor and Lena Horne. How important it was to see people like me in what I affectionately called “The Black Wizard of Oz.” But it took me dozens of views to realize The Wiz was more than an all-Black adaptation of the 1939 Metro-Goldwyn-Mayer classic. It was, and remains, a powerful critique of anti-Blackness and racism within America. Dorothy, played by Diana Ross, gets transported from her home to an abandoned park in a fantasy version of New York City by a snowstorm. When she descends from the sky she lands upon and kills Evermean, the Wicked Witch of the East who rules Munchkinland. The Munchkins, who had been transformed into graffiti by Evermean for painting the playground walls, are overjoyed. Here, viewers are injected into a storyline many Black Americans are familiar with: urban gentrification. The neighborhood was no longer theirs. Not theirs to inhabit. Not theirs to decorate. And Evermean represents the influx of outsiders who redesign neighborhoods and destroy its history. The happiness of the Munchkins is not simply because they’re no longer frozen, but also because of their newfound freedom in a space that is no longer their’s. How they will take it back isn’t explicitly examined in the film, but anyone who’s familiar with the destruction of anything that belongs to Black people knows reclamation is a difficult process. When Dorothy is instructed to follow the yellow brick road to get to The Wiz and get home, she is forced to walk because the cabs won’t pick her up. Similar metaphors are presented in the rest of the ensemble cast. The Tin Man, found crushed between parts of a rollercoaster at an amusement park. He tells Dorothy and Scarecrow: “The genius who created me only took care of my dashing good looks, my razor sharp wit and my irresistible attraction to the wrong women.” He adds that he was “crushed in his prime” by his fourth wife Teenie, and also calls himself a flimflammer, defined by dictionary.com as a trickster, swindler or cheater. The Tin Man’s lack of heart can be understood as metaphor for indifference, brought on by possible heartbreak and his resulting mistreatment of women. How boys are conditioned to handle their masculinity during their formative years has lasting effects into adulthood. This conditioning comes double-time when we examine hyper masculinity, and how it’s enforced upon Black men. They’re supposed to strong. Aggressive. And hyper sexual. Subscription to these beliefs often results in the mistreatment of women, and a resulting callousness that many men don’t escape until they have a daughter, grow out of it, or something of the like. The emotional maturity that Black girls are expected to have before they actually mature isn’t extended to Black boys. A similar examination of Black masculinity is presented when the crew happens upon the Cowardly Lion during their walk to The Wiz. The lion, full Fleetwood Coupe Deville, has been exiled for being incapable of being king. It is clear that for him, king is synonymous with stereotypical masculine gender traits like self confidence and aggression. The exact opposite of a “cowardly” lion. 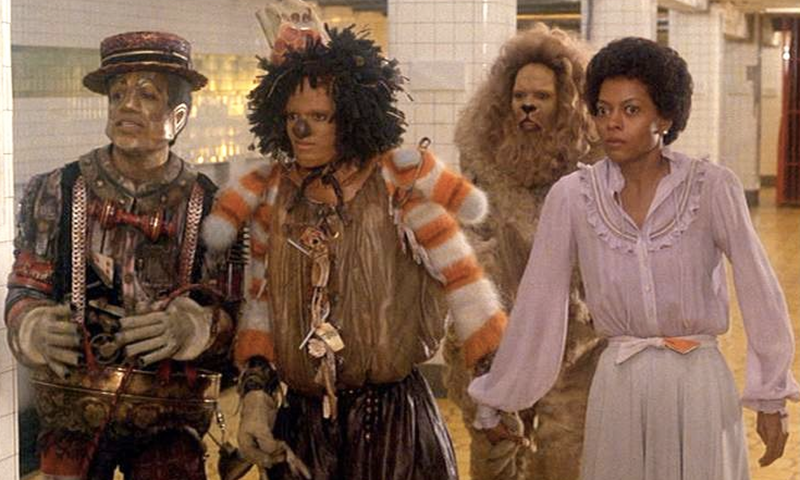 The Wiz’s metaphors exist beyond an examination of character traits. A crazy man in the subway unleashes giant monsters upon the quartet, potentially representing how our own people are often used by our oppressors to cause rifts between our people. The “Poppy” Girls put Dorothy, Toto and the Lion to sleep with a special substance, possibly representing the injection of drugs within our communities. The crew stopping their attempts to take cabs, and as a result the vehicles begin to look worn out and broken down (kind of hard to stay afloat when Black dollars are so essential to your business, much like many businesses). The gatekeeping of Oz and the separation of the Black bourgeoisie from other classes. When viewers finally enter the sweatshop of Evillene, the Wicked Witch of the West, they find the workers doing menial work under slave conditions. Evillene even cracks her whip as they work. Her Flying Monkeys appear as if they are blackface. And when Dorothy and her crew succeed at melting Evillene, the Winkies who work at the sweatshop shed their ghoulish masks and costumes to reveal beautiful Black people underneath. The group returns to The Wiz’s quarters and expose him as a phony and failed politician. It is then where Dorothy helps everyone realize that what they have so desperately been trying to get from him has been inside them so long, a realization that would not have come without inter-community support and fellowship. One would be remiss to watch The Wiz and not notice the grand metaphors about pro-Blackness, anti-Blackness, gentrification, hyper masculinity and more. And while I certainly didn’t understand why my elders were so adamant about me watching the film as a child, I see why they insisted as an adult. Through energetic song and dance numbers and powerful monologuesThe Wiz positions Black existence as one marked by struggle, determination and beauty. And that is more than enough to run it back today, and everyday.